I am so happy with how the girls' bedroom turned out! It is so cute and girly!!! I took some photos to post, but they hardly do it justice. I think it looks so much prettier in person. The girls were so excited and are really enjoying their new room. Like the boys' bunk beds, the girls' bedroom furniture was also handed down to us from my parents. It had been the twins bedroom furniture, before my mom redid their room a couple years ago. The crucifixes above the beds were favors from one of Hubby's brothers' ordinations, and blessed by the newly ordained "Uncle Father"! I am also thinking about maybe hand-painting or stenciling their names near their pictures, but I haven't decided for sure. Above their window is this cute little quote that I found awhile back at a local boutique. I also have some curtains to hang, but before I can I need to exchange the rod for one that is a little bit longer. On the floor in the middle of the room is a bright flowery rug. At the foot of Chiquita's bed is their bookshelf. There was a little hole already on the side so I ended up hanging Twinkle Toes' Carmelite Cross there for now, a gift from one of her Uncles. On top of the bookshelf is a darling picture hubby found at an antique shop, when he was still single, and a little lamp from my mom. So precious! Here is a photo taken from the doorway. 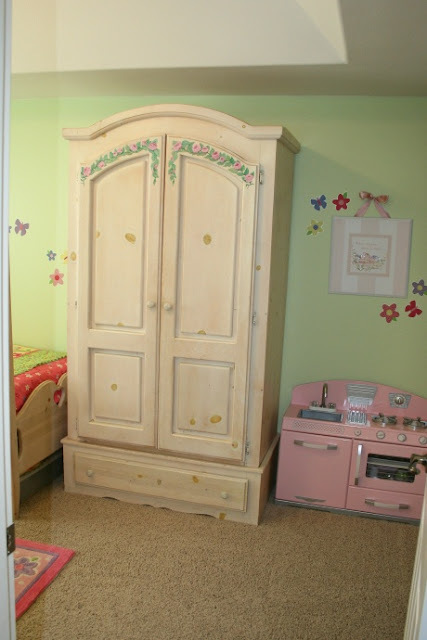 The armoire is at the foot of Twinkle Toes' bed and their little play kitchen is to the right. Here is the opposite end of the room, behind the door. Along the back wall is the closet organizer. I am thinking of possibly hanging a curtain on each side to cover their clothing, at least until we are able to add a wall and/or doors to finish the closet. On the open closet shelf are two angels that were a gift from their Great Aunt Bridget, my dad's youngest sister and a WONDERFUL Aunt, on the day they were born. Aunt Bridget is the one that always takes care of our children for us when we are at the hospital welcoming a new little one. Also behind the door is a Fairy themed growth chart that was made by my own, very talented, Godmother! She also gave the girls this beautiful artwork from one of her collections. I wish I could have gotten a better picture, it looks so much nicer in person! Well, it is now bedtime for my girls and so I am off to read them a story and tuck them in for the night. Goodnight and God bless! Update: I posted a picture of the new curtains here. oh their room is gorgeous Jessica. Your girls must just love their room, it is so pretty!! Sorry forgot to leave my name: Zeliemum. It is just beautiful and perfect for little girls! That hard work payed off!! I would love a room like that! How are you doing all this work with 5 children and pregnant, too???? It's beautiful. I've told you that Ava has the same quilt, and we painted their room almost the exact color of your girls' room a few months ago. I'll have to post a picture! It came out great! It looks terrific! I love the combination of pink with apple-green! Love it! How gloriously girly!! It is just SO CUTE...I'd love a room like that! All of the coordination in the room must have taken a lot of work...beautiful finished product. 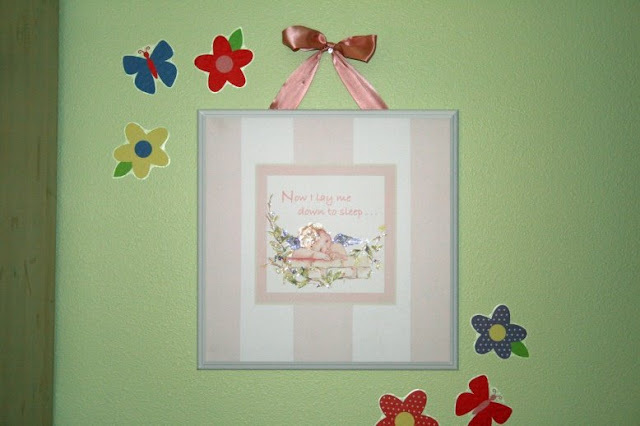 May I ask, where did you find the butterfly/flower wall decals? If they are easy to remove, they would be perfect for my daughter's side of the co-ed bedroom. A beautiful spot for little ladies. Nicely done! Great colors. Jessica the room is so sweet. We need to do our girls room too! I love what you have done. The banner is my favorite! I was looking at the closet and thinking the curtians would make a nice addition. If it was a boys room I would suggest building the wall, but since its the girls.......I say leave it open and add the curtians. Thanks for sharing! You really have nicely sized bedrooms! Love the ceilings! Everything is so beautiful - great job!!! It turned out so nice, Jessica. I hope they keep it nice and clean. :) The boys' room looks great too. I wish my children's bedrooms were so spacious. "Uncle Father," hee hee. My youngest brother is a seminarian, and my four yr old was wondering if she can still call him "Uncle Tim" once he becomes a priest! I like "Uncle Father," too funny! We already joke that another uncle is called "Uncle Doctor" since he earned his doctorate earlier this year! And clever way to rig up a closet where there isn't a real one! Oh how very sweet! You know just how to nurture the heart! God bless you. What a lovely space for your sweet girls, Jessica! I have to admit, you and a few other blog moms have inspired me into a fit of organizing and redecorating! Thanks for sharing the inspiration through great photos!God bless. Lovely room! We have the same bedding in my girls' room! My girls are older than yours and it's still perfect (9 and 13). I llove that you have such an abundance of faith items in thier rooms. Just having friends over to play is an act of witness! What a special haven you have made. I put my girls names on their walls using wooden letters from the craft store and blue tak. They have been repainted (we went through a polka dot phase last year) and moved several times (they were above beds, now Min's is over her desk and Crickets is over her stuffed reading chair) and they didn't make a mark on the walls. you for sharing the pics with us. The green is perfect. The room is absolutely lovely. Thank you everyone!! I was so excited to share all these photos with you. Sara ~ The decals are from Target. They were part of the Happy Flowers Bedding Line. Steph ~ I LOVE that idea, and just might use it!! Thank you! This is great! I am doing my boys' room this summer, also with decals from target, I will put up pictures and the story soon, but this is very inspiring and looks like a great space! Jen L. ~ The bed frames are rather narrow (which is prefect for this room!) but they still hold twin sized mattresses. I hope you are able to find what you are looking for. Thanks for the reply. The room really is wonderful. The newly decorated room is absolutely adorable! I just love it. Great job, mom! Thank you for showing us these beautiful photos! Such an inspiration for us mothers with girls. God bless!